I believe that this need for meaning in one’s life, this basic individual desire for passionate contribution to a worthy cause, represents the holy grail for the transformational leader. The public sector is notorious for its resistance to change, inflexible bureaucratic procedures, and ineffective strategies. O’Connor provides a fresh, bold perspective shedding light on the leaders who bucked this trend and instead empowered those around them to effect true and vibrant change in public service. 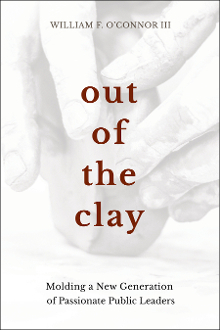 Out of the Clay takes “leading by example” to heart with a series of interwoven anecdotes from O’Connor’s years of experience, each illustrating the vital tenets of transformational leadership. To the next generation of public-sector leaders, let this book guide you on your own journey to cultivate a passionate and fulfilling life’s work.